Door-to-door sales, no leads, no desk, no chair…no problem. This is a complete playbook for door-to-door sales reps and teams. 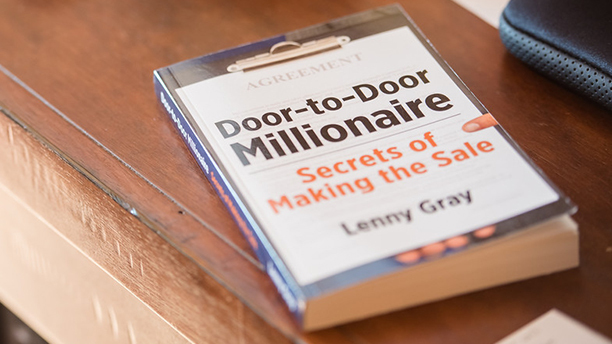 Door-to-Door Millionaire: Secrets of Making the Sale contains proven sales methods that work in the harshest sales environments and can benefit readers in any walk of life. With expert techniques that can improve sales and communication skills of everyone from Fortune 500 sales professionals to strip mall shoes salesmen, this guide teaches readers how to recognize vital nonverbal clues, how to resolve the five most common customer concerns during the sales process, and even includes a homeowner’s guide on how to effectively get rid of door-to-door salespeople. These strategies and methods shed light on how door-to-door sales reps generate hundreds of millions of dollars annually. Filled with real-life examples of how these cutting edge strategies can lead to success, this guide will teach readers everywhere the principles needed to be most effective in sales and everyday life. Door-to-Door Millionaire instills invaluable and extraordinarily effective sales principles to readers everywhere. Not just for door-to-door sales reps, this informational resource can be used by anyone looking to improve their sales or communication skills with others. The first book of its kind to specifically list door-to-door sales techniques, this resource utilizes established techniques that can work even in the most hostile sales environments and can benefit readers in any industry. Exceptionally useful and applicable toward a diverse range of scenarios, this enlightening resource will help readers everywhere maximize their potential. Inspired by a long and successful career in door-to-door sales, Lenny Gray compiled these effective and results-proven strategies. Packed with the most effective techniques available, this excellent tool can be used in a multitude of situations, even in everyday life. A unique, diverse, and life-changing guide, this fantastic book will help business professionals everywhere take their potential to the next level.